Yes you read that headline correctly. 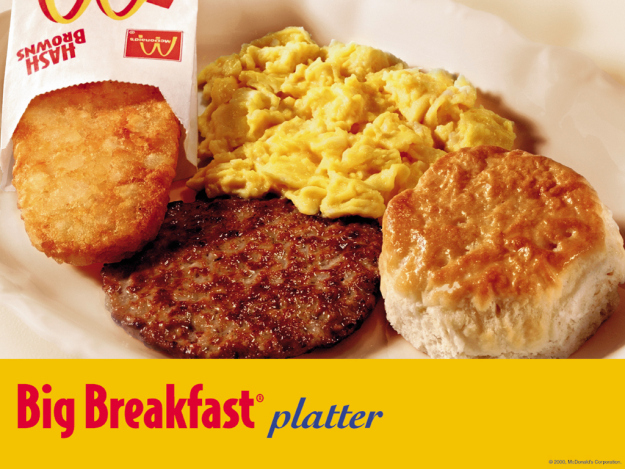 On October 6, 2015, McDonalds will start to offer breakfast all day long. “Company officials announced Tuesday that they will begin serving breakfast all-day nationally on Oct. 6. Restaurant operators approved the move in a vote Tuesday. This is probably the most dangerous thing to happen to America since the AIDS epidemic. Let me paint the picture for you. It’s Friday night and you and your buddies are going out. You spend the evening bar hopping, slamming tequila shots, dancing like the pathetic white boy dancer you are, trying to salvage whatever motor function you have left as you talk to the girl who you think is a 9 but is actually a 4. You wake up alone the next morning at around 11 with 5/6 of the money you went out with missing and having no recollection of how you got home until you check your phone and see you spent $44.12 on an Uber. Now, imagine then going to McDonalds around noonish/1:00 and consuming a sausage McGriddle or two? Forget Monday, you would be lucky to make it back to work by Tuesday. I would honestly rather just stand there with my hands behind my back and let Floyd Mayweather knock me out, noses heal, arteries don’t. I’m calling that America’s productivity will be at an all time low, but what do I know? Its not like I’ve ever eaten McDonalds and know first hand how severely damaging it can be to your life as well as your loved ones. America, gotta love it, you can’t bet $20 on a football game but you can order an egg McMuffin at 4 pm. Despite the morbid consequences, I’m actually all about it. Some people get a thrill from doing an obstacle course in mud, others like to test their bodies limits by eating McDonalds breakfast in the afternoon. Just don’t say you haven’t been warned, America.